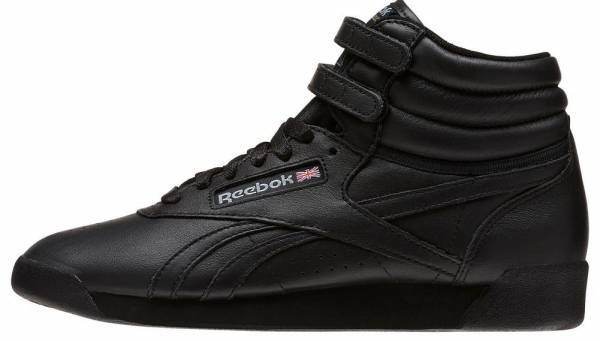 Many reviewers shared that they liked the classic nostalgic design of the Reebok Freestyle Hi OG Lux. Some even shared that they received compliments from strangers while wearing this retro shoe. The high-quality materials used in the RBK Freestyle Hi OG Lux were praised by many buyers. The majority of wearers commended the comfortable fit of this shoe. Many users liked that this pair can be used for various events, from light training to city strolling. Several long-time users revealed that this pair is very durable. A couple of users revealed that this pair is easy to put on because of the presence of the very soft terry cloth lining. They described this as better than other boots available in the market. Few users complained about the narrow width of the Reebok Freestyle Hi OG Lux. They suggest grabbing a full size up than the buyer’s usual size. The comfort that the Reebok Freestyle Hi OG Lux offers is nearly hard to beat. Presented exclusively in women’s sizes, this classic profile uses an ultra soft leather upper that displays a monochromatic colorway. This well-padded mid-cut sneaker delivers a superb ankle support suitable for the strenuous activities. Highlighting the comfort and the durability at a reasonable price point, it is hard to come up with a reason to not try the Reebok Freestyle Hi OG Lux. Reebok first introduced an athletic shoe line exclusively for the women in the early 80s. This brilliant idea further catapulted the fame of Reebok in the market. The Reebok Freestyle was released in 1982 that was specifically intended for cardio and stretch sessions. The Reebok Freestyle uses a glove-like leather that is soft and light. Many applauded this feature that even some men were seen wearing this well-celebrated shoe. When Jane Fonda, a very famous actress and fitness guru in the 80s, used the Reebok Freestyle in her workout videos, the sales of the said shoe received an upswing result. Since then, the company began supporting various clinics and workout programs from the 80s to the 90s while promoting the Reebok Freestyle. Reebok released two variations of the Freestyle. They have a low-cut profile which looked like a tennis shoe and the-mid mid cut that uses a well-padded ankle support with Velcro straps. The Reebok Freestyle Hi OG Lux kept hold of its throwback design, making many retro lovers rejoice. It features a glove-like soft leather on the upper with superb ankle support making it very comfortable to be worn for various activities. Many users wear their Reebok Freestyle Hi OG Lux in their workout sessions or even while just touring the urban streets. Most of them don this pair with their active wear, jeans, joggers, leggings, shorts and even with their dresses. The Reebok Freestyle Hi OG Lux is available exclusively in women’s sizes from 3 to 12 US. This pair only comes in medium width that is why a large number of reviewers suggest buying a full size bigger than the usual size especially for buyers with wide feet. The mid-cut profile has a well-padded collar for a comfortable fit and ample ankle support. Meanwhile, the lace-up fastening system with Velcro straps provides a personalized secure fit. The well-padded ankle collar gives the Reebok Freestyle Hi OG Lux a striking feature for many buyers. This feature gives its wearers a melancholy feeling of the classic fashion. Another notable feature is the presence of 2 Velcro straps on the ankle that provide a snug fit and support as well as swag style. The Reebok Freestyle Hi OG Lux has a terry cloth inner lining for an additional comfort. It has leather overlays stitched on the quarter extended up to the heel. This element adds more support to the sneaker. This feature makes this shoe distinct from the Reebok Freestyle, which only has the running stitches. It has the EVA midsole for shock absorption and superb cushioning. The rubber outsole has high abrasion capacity for durability. It has perforations on the vamp and quarter for breathability. The Reebok label is woven on the side and tongue. It has the gold lace tip and gold details on the sockliner.